(September 17, 2018) BATESVILLE, Ind. — The City of Batesville and Margaret Mary Health (MMH) hosted a ceremonial groundbreaking of a new park on the east side of Six Pine Ranch Road on Friday, September 14. MMH donated the three-acre parcel of land to the City for development of the park which is projected to open in 2019. 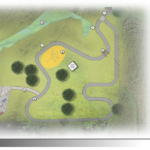 The park will feature a walking trail, playground sites, picnic tables and benches, an observation deck, and parking areas. The trail will connect to the existing walking path behind the Margaret Mary Outpatient & Cancer Center. The City has contracted with HWC Engineering for the planning and design of the park. Construction is expected to begin early next year. In addition to the hospital’s land donation, approximately $25,000 has been donated from private citizens. The Batesville Parks Department is accepting monetary donations for the purchase and installation of amenities at the park. Contact the Parks department at (812) 212-0603 for more information. Click here for the donation form. This entry was posted on October 5, 2018 by Steven Harmeyer.